ML, a Dreamline 34 delivered in 2016, is now exclusively for sale with Bluewater, asking €8,950,000 (VAT Paid). 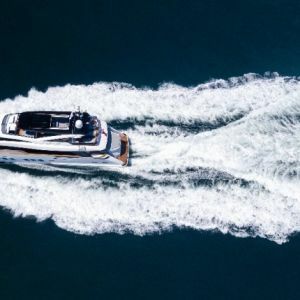 Delivered in 2016 by DL Yachts, the award winning ML provides the facilities and volume of a much larger yacht in an elegant and sophisticated package, with accommodation for 10 guests. She is in immaculate condition and has been only lightly used by her owner. The stunning interior is beautifully finished with cream furnishings and dark accents highlighted by custom Murano glass. 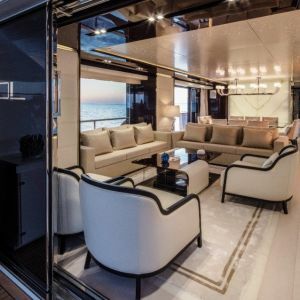 The master suite, located forward on the main deck benefits from panoramic views as well as access to a private deck area at the bow. The remaining four cabins – two VIPs, plus a double and a twin are on the lower deck. All are finely decorated and adjoined by onyx and marble-lined bathrooms. 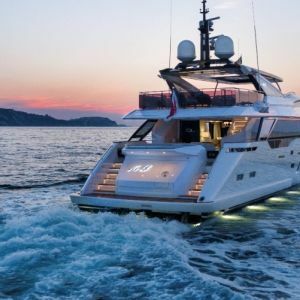 Motor yacht ML also offers fabulous exterior spaces with dining areas on both decks plus a custom glass spa pool and bar on the sun deck and the owner’s private terrace at the bow. CMC stabilisers ensure that guests have the minimum of motion and the maximum comfort at all times. Access to the sea is excellent by a hydraulic sea stair at the stern and a hydraulic side passerelle. 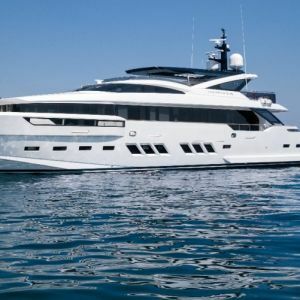 ML is located in Imperia, Italy and available for viewings by appointment. Please contact Tom Barnes for further information.